Welsh weightlifter Darius Jokarzadeh believes winning World Junior bronze will be a springboard for success at next year's Glasgow Commonwealth Games. Last month Jokarzadeh, 19, became the first British lifter to win a world junior medal for 18 years after finishing third in Peru. I think if I lifted [in Glasgow] tomorrow I'd win, so hopefully next year I'll guarantee myself a gold. "It was a big confidence boost," Jokarzadeh told BBC Sport. "I think if I lifted [in Glasgow] tomorrow I'd win, so hopefully next year I'll guarantee myself a gold." "It [the Commonwealths] is a stepping stone for Rio 2016 which is my ultimate aim, but it will be good to represent Wales who have been so supportive." The +105kg lifter narrowly missed out on selection for London 2012 after judges ruled his final lift at the British Olympic trials was not legal - a decision he is still frustrated by but is hoping he can use to improve his future prospects. "I worked non-stop for two years for that [Olympic selection] and to not be taken in the way I was, I still feel bad about," said Jokarzadeh, who has a personal best competition total lift of 386kg, but has achieved over 400kg in training. "I used it as a drive for the Worlds and it will continue to fuel me." 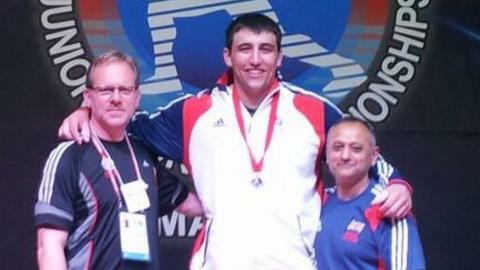 Jokarzadeh, who turns 20 later this month, is one of only seven funded British weightlifters and whilst he also receives support from Sport Wales the British Champion could soon swap the UK for the US. "I'm looking at going out to America and Pennsylvania to study biology," he said. "I'm quite a bit ahead of everyone in my country [in the +105kg division], the gym facilities [in Pennsylvania] are great and a change in scene will also help. Jokarzadeh's next competition will be the British Under-23 Championships on 15 June, before thoughts turn to the World Championships in Poland in October.